U.S. Bankruptcy Judge Mike Nakagawa ordered that Goldberg is unable to accept any clients for the next 6 months. Nakagawa referred the attorney for investigation by the U.S. attorney, the Nevada secretary of state, the Nevada attorney general, the Clark County district attorney, the State Bar of Nevada and the office of the United States Trustee. “Goldberg’s violations are aggravated by his previous disciplinary misconduct, his multiple offenses and pattern of misconduct and his refusal to acknowledge the wrongful nature of his conduct,” Nakagawa wrote. We’ve warned you about him before and now finally something is being done to protect the public. He is however able to still represent his current clients. It has been estimated that he represents around 200 clients per month so I’m really glad to see that a large number of people will need to look elsewhere for their bankruptcy needs. I implore everyone to do their research before picking up the phone or e-mailing an attorney. There are a number of very good attorneys that are affordable and very capable. Don’t be drawn to these lawyers that advertise all over town and say they’ll do it for “half” (you know who I’m talking about). Please do your research and don’t let these lawyers continue to make money off the unsuspecting. 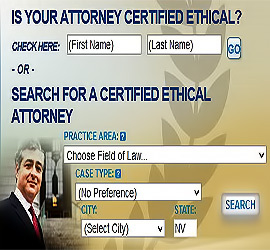 Check out www.attorneyguide.com for Certified Ethical Lawyers. We have done extensive background checks to make sure you don’t have a really bad experience that you end regretting.